Where is the "Szarvasi-1" energygrass used? The improving plantmaterial came into existence by the cross-fertilization of plantmaterials collected in the szik soil areas of the Great Plain and in the arid areas of Middle-Asia. The genotype peculiar to the class is the result of a 10 year improving work. Perennial, stolonnal thready grass. The strong roots probe deeply into the soil /1,8-2,5m/ in quantity from its stem, its stolons. 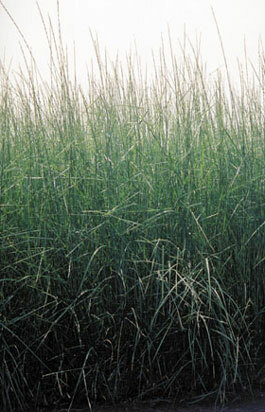 Its greyish-green stalk is sparsely leafy, straight, with smooth surface, hard and 180-220 cm high. The number of noduses is only 2-4. The greyish-green leaves are rigid, their surfaces are a little rough. The inflorescence is straight, 20-30 cm long, earfacing cluster. It sprouts in the middle of April and flowers at the end of June - at the beginning of July. At the end of July - at the beginning of August, its graincrop is ripe to harvest. Its graincrop is the shape of a lance, 0,8-1,2 cm long. Thousandgraincrop mass is 2,8-3,8 g.
In the 20th century, the big development of the oil industry ousted the biomass base energy sources and raw materials in such an extent, that at present 90% of the fossil raw materials are used for power generation. It is well-known tliat the increased usage of the coal base energy sources resulted in the breakdown in the equilibrium of the gascomposition of the atmosphere. In the last 150 years the carbon dioxid quantity in the air increased by 28%, the concentration of methane by 50%, the quantity of the dinitrogen dioxids by 13%. This unpleasant situation, and the worldwide decreasing of coal, oil and uranium requires the urgent change in the attitude towards the conservation of energy. However, the big question is that in case of decreasing the coal base and nuclear energy sources, what kind of alternatives the reviving energy sources with abundant potential could give, especially energy sources based on biomass. The examination of these problems, the possible change in the source structure of the energy consumption and the need for the practical application of alternative solutions recommended for realisation, induced intensive researchdeveloping activity both at home and internationally. Nowadays there are numerous promising results show the possible routes for the future. Among these, it is undoubtedly necessary that the constantly regenerating energy sources should take part in the conservation of energy in greater scale. So the energetical purposes of the EU are that the regenerating energies in the energy sources should reach 12% until 2010, and it should take the 22% of the whole electricity production. Due to its ecological capacities, the biomass is the most important form the regenerating energy sources. This source can settle the acute problems of country development apart from its well-known advantages in enviromental protection and the sectoral-strategical considerations. - The ploughing cultivation sector will retain its dominating role in an agriculture that is adaptable and fits into the enviroment. This sector should concentrate in areas that are relatively little tolerant to enviromental conditions in case of a protective and enviromental friendly farming. The territory will probably decrease by one million hectare, especially in the extensive production zones. - In the extensive land using zones, on ploughing areas /700-800 thousand hectares/ with low tolerance to enviromental conditions and with low agricultural potential and which are not afforested, only moderately economical, or non-economical cultivation of plants can be pursued. Well, these are the areas that create the conditions and needs to cultivate energy grasses. 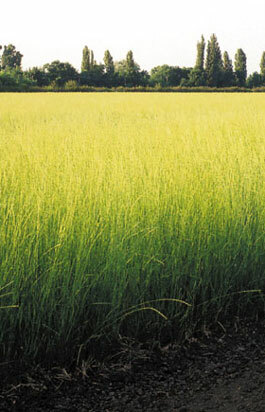 Realizing the importance of using the biomass in a number of ways, the Agricultural Research Development Institute P.U.C., Szarvas began the breeding of grasses suitable for industrial utilization / energetical, industrial fibre, base material of the paper industry/ first in Europe. Producing, improving the kinds of grass, which yields big drymaterial mass and in this good quality cellulose, and which is suitable to utilize in the energetical, paper-, wood-, textile-, and building industry. These kinds of grass, taking soil-utilization, economicality and enviromental protection, offer and ensure new marketing perspectives and employment facilities for the disadvantageous ecological areas. The results of national and foreign /Chinese, Turkish/ examinations have confirmed that the "Szarvasi-1" energygrass excellently tolerates the 200-2100 mm watersupply yearly, the 5-19 C average temperature yearly, and the 5-9 pH reaction soils /szik, sodium, salty/, so it tolerates dryness and frost perfectly. Its drymaterial crop /10-15 t/ha/I. growth/, thermal value /14-17 MJ/kg drymaterial / approaches the similar value of the poplar, willow, locust trees, and our brown coals. Its holocellulose content reaches the content of pinetrees and broad-leaves trees, and exceeds some of the one year old plants. Its lifespan is long, it can be cultivated at one place for even 10-15 years. It gives full crop in the following year from the plantation in spring. The unambiguous advantage over the energyforests that the recycling takes place annually, so the utilization of the processing capacities is more efficient. Its important agronomical feature is that it can be cultivated efficiently from both sandy soil to szik soil, and from areas with inland water to dry-located areas. It is capable of producing 10-15 tons of drymaterial annually by using only 68-85 kg/ha N-agent. Its cultivation and harvesting does not require any expensive machines /eg. :energyforest/, these can be executed with the machine-sytem of the grains and provenders. The production of its seed is simple and economical. Its green shoot crop can be pastured until late autumn. It enriches the soil with large quantity organic material /roots, humus/ after ceasing its cultivation. Besides the economic reasons, it should be taken into consideration, that the local governments can utilize the energygrass plantation in the local energysupply and they can also solve enviromental protection problems at the same time / recultivation of waste heaps etc., reducing the quantity of flying dust/. We can obtain national energy sources with short, cheap transports due to cultivating and utilizing it. With the cultivation of the energygrass a new agricultural main product can appear (base of energy and paper industry), which means new marketing perspectives, safe income position and it gives employment facilities for the agriculture and disadvantageous ecological areas. And last but not least, the energygrass can replace wood as base material in numerous fields because of its similar or better features. It becomes more possible to rescue large forest by partly replacing wood industry products with energygrass products. Agricultural Research Development Institute P.U.C. 5540 Szarvas, Szabadság út 30. Pf. : 54.